Book Creator–(iOS/Android) templates to create digital comic books and graphic novels. 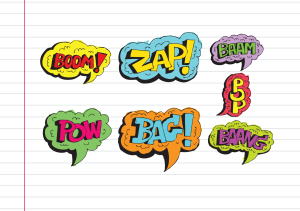 Comics Head– add their own images or can choose from their library of characters, backdrops, and speech bubbles. Students can draw in the comic. Lomics (iOS) create comic style videos. Marvel– Create comic strips and books with Marvel characters.